What can I say??? Nancy continues to amaze me with every line – and book – she does! In Home Grown, she showcases those values that we all try to achieve in our own lives. And, in typical Art To Heart style, she has thought of everything! The fabric collection from Benartex – Home Grown by Nancy Halvorsen will be available next month – and comes in ten or 15-yard assortments. I have showcased her signature teal below just so you can see some detail, but all of the colors are gorgeous. Gray is the new neutral – and she has that covered as well! With this line, she offers a set of six tea towels which can be used to make the projects above. OR, buy them by the bolt! These yarn dyes are 43 – 44 inches wide. Just look at the details on these individual blocks of the cover quilt. Look what you can do with a panel!!! Of course, it doesn’t stop there! The embellishments add that awe factor to each block! These buttons are available for individual blocks are as an entire set. Why not do this as a block of the month? Make a block each month as well as a smaller project that will make great companions to add that Martha Stewart looks to your room. Or, have ideal gifts on hand when needed. Who wouldn’t love that??? I wrote about Nancy Halvorsen’s newest book – Imagine – a few weeks ago – and now it is #1! Nancy Halvorsen fans know that her embellishments add the awe factor to all of her designs. And now the button packs are entered in our system. 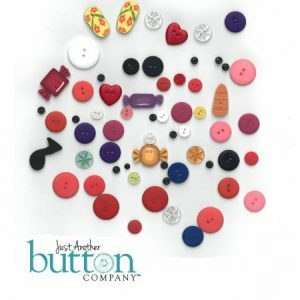 There are individual button packs when needed for each individual block as well as an assortment for all of the buttons needed for the entire quilt. The button packs and the fabric are all due to arrive the end of this month so order everything you need now so you can start kitting immediately. Don’t you just love it when a plan comes together??? Nancy Halvorsen has THREE books in the top 10! There is a reason she is a legend! Her newest book – Christmas Pure and Simple – is her latest book, and is already in the top 10! Christmas is about Jesus, pure and simple! This book focuses on the nativity story, and was a way for Nancy to share this love story with her grandchildren. This nativity scene doesn’t break! Or make a nativity quilt…. The hardest part will be choosing your first project! The books are in stock. The buttons and hangers will be arriving soon. Order the book and choose your samples…and place your orders! Nancy Halvorsen sets a Fine Table! Every time I think she can’t do anything new, she wows us all! Nancy’s new book – Table Please Part two – has that awe factor that you just can’t resist! To order or to see who has it in their store, visit our website at: //www.checkerdist.com/products/ATH550B? Look at these chair covers! Santa hats – really??? And they are an assortment of fabrics which just adds to the fun! The Merry table runner with Santa peaking out is adorable – and did you notice that she uses an upper case and lower case “r” to add to the appeal? Extend the holiday season with snowmen. This winter, you could leave up snowmen until Easter! And don’t you love the snowmen arrangement with ear muffs no less? For a classic, clean look, why not stitch this wall hanging? But this book isn’t just about the winter holidays. Fall is covered as well. Who doesn’t love mummies??? The eye ball centerpiece has to make you smile! These are the cutest spiders I have ever seen! We all have so much to be thankful for – so why not make that our mantra for every season? It is time to restock Part One as well – after all – that covers Spring. And after this winter, we are all waiting for some sunshine! Now we have ALL of the pieces in place! Just as I was inspired again by Nancy Halvorsen’s new book – Ho Ho Ho Let It Snow – we have entered the book, fabric, hangers, and buttons in our system. Who wouldn’t be inspired after seeing her booth at Spring Market! Who would have thought that Nancy’s special shade of blue would be the perfect background fabric? I know this is a lot of pictures, but in this case, a picture is really worth a thousand words. And I wanted you to see the detail and quality that goes into every one of Nancy’s designs! There is a reason she is a legend – she is an expert quilter and it shows!!! All of these projects are from this book…. And feature this fabric line…. available by the bolt or in a 15 yard bolt collection…. If you have already ordered it, it should be arriving any day so it is time to get your ducks in a row and order the companions as well…. The buttons for the entire book are available as a kit – or can be ordered separately by project. Buttons for the Christmas Tree Table Runner…. Buttons for the Gather Pillow….who would have thought that so much love could be communicated in just one word????? And then there are the hangers…..
Nancy’s designs are the perfect opportunity to kit! Combine the buttons, hangers, and fabric in one kit. Include Print n Fuse in the kits. Print n Fuse is available in 3 sies – 12, 50 or 100 sheets – PNF12; PNF25; or PNF100. This fusible web is made to run through a printer so you can trace the shapes once and your customers won’t have to. Remember, everyone still needs to buy the book! But. this is value added service and they will love you for it! A CheckerYou video featuring Nancy explaining how she uses the PrintNFuse will be uploaded this week. If you have a Checker account, check it out! Checker is sponsoring several book signings during Market. Come visit with these talented artists who will share their incredible talents! Kay Whitt will be sharing and signing her new book – Sewing with Serendipity! Margaret Travis is sharing projects from her book – EZ Peazy Gifts and her Cut Loose Press patterns. Join your favorite Swirly Girls as they share their newest book – Sew Sweet…. Pam Lintott will be signing the latest addition to their ever popular Jelly Roll series – Dessert Roll Quilts. 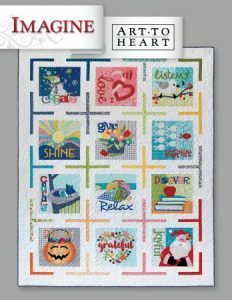 Kathy Brown is sharing her new book Fat-Quarter Quickies – based on her Fat Quarter Creative Grids ruler…. Joan Ford is signing her new book – Scraps Plus One! Her unique style crosses all generations and appeals to everyone. She has created her own signature in every piece she designs. When you can instantly look at a project and know it is a Nancy Halvorsen design, you know you have just met a legend! But with every fabric line and every boo that showcases it, she continues to grow and keeps her finger on the pulse of what is trending. Ho Ho Ho Let It Snow is no exception. I noticed a few weeks ago that round pillows were turning up in patterns and home dec magazines. What is on the cover of Nancy’s new book???? Round pillows with the most adorable snowflake designs. Geometrics and quilts with no defined block patterns are the rage – and look at this feature quilt! How does she constantly stay ahead of the trends??? Fonts are cutting edge….and look at the lettering on these pillows! And what adorable ornaments that are showcased on a wire tree! These little quilts make the perfect gifts – whether you choose to hang them or use them as mug rugs…..
We posted the book on our website as soon as we got pictures because we just couldn’t wait to share! Our buyers are working frantically to get in all of the buttons, hangers, and other notions that you will need to finish all of the projects in the book. But pre-order the book now so you will have plenty in stock when the fabric arrives. And, Nancy, thank you for making us smile once again! This article is the second in a series that shares how to sell Christmas fabric all year long! The order of the projects is up to you. If you have a lot of fabric left, choose projects that require a lot of fabric early in this monthly series. If you have bits and pieces, choose scrappy projects. Remember – Christmas fabric will be arriving again in May or June so plan accordingly! These mother/daughter aprons are adorable and are a great way to show off some fun Christmas prints. Coordinating fabrics for the children’s apron would be adorable – and did you notice the doll is wearing an apron as well? Why not have your customers start a new tradition and bake cookies with family and friends? Have them bring their favorite cookie recipe to class and share – why not make it a party? Some over-achievers may choose to bring samples – wouldn’t that be grand??? But these aprons would be great Mother’s Day gifts as well so why not display other coordinating fabrics? Or, why not offer it as a mother/daughter class or grandmother/granddaughter class? I love these mats and wraps by Bareroots. They come in kits or patterns – and a variety of designs. There are designs for every holiday and season. Fill quart jars with treats or include a candle as part of the gift. The possibilities are endless! Table runners are always great gifts and this one is a great way to use up those green fabrics and red stripes. This jewelry made with zippers are great Make It Take Its. Teach your customers how to make them – and they can teach their guests during those Thanksgiving football games! There are even packages of zippers in appropriate colors – Item #IJZ103. Embroidery is great handwork – and there are lots of choices. This mantle cover by Kathy Schmitz will become a classic. You may not have the time to make everyone Christmas quilts but pillow cases are another matter! Towels are always a cute gift. There are several patterns available including these by Bird Brain Designs and CrabApple Hill. Or, you can plan a whole series of classes around one book! This book has enough projects for six months of classes – with some left over! These gift tags would make a fun make and take. Who wouldn’t love any of these pillows. The one featuring rickrack can be done in any colors – for any season. Why not substitute wool for some of the designs. This garland and three paneled screen would look great anywhere. Choose your favorites and plan your schedule now!